The Platina 110 is powered by the Discover 110’s 115cc engine. It also gets CBS (combined braking system). Priced at Rs 49,300, it commands a premium of roughly Rs 2000 over the 100cc Platina. Bajaj has launched a new version of its popular entry-level motorcycle, the Platina. Powered by the Discover 110’s engine, this new version will be known as the Platina 110. In addition to a more powerful engine compared to the 100cc Platina, the bike also gets combined braking system (CBS). The motorcycle has already reached select Bajaj dealerships and is priced at Rs 49,300 (ex-showroom, Delhi). The 100cc Bajaj Platina continues to retail for Rs 47,405 (ex-showroom, Delhi). For a premium of just under Rs 2,000 over the Platina 100, the new motorcycle gets a larger engine and a combined braking system that Bajaj has chosen to brand ‘Anti Skid Braking’. CBS redistributes part of the braking force applied on the rear brakes to the front brakes, which reduces skidding while emergency braking. The inclusion of CBS is in line with the government’s mandate of equipping all bikes below 125cc with CBS. Moreover, the Platina 110 offers drum brakes at both ends as standard, while a front disc brake is offered as an option. Coming to the engine, the 115cc air-cooled mill produces 8.7PS of power and 9.8Nm of torque - a bump up of 0.8PS and 1.46Nm over the 102cc engine that currently powers the Platina. The Platina 110 is also longer by 3mm and taller by 7mm as compared to the existing Platina. While the front continues to sport telescopic suspension, the rear gets twin gas-charged shock absorbers. And as can be seen from the picture below, the rear shock absorbers are of the SnS (spring in spring) variety. The SnS suspension system uses two springs instead of one and is designed to offer better ride quality over poor surfaces. 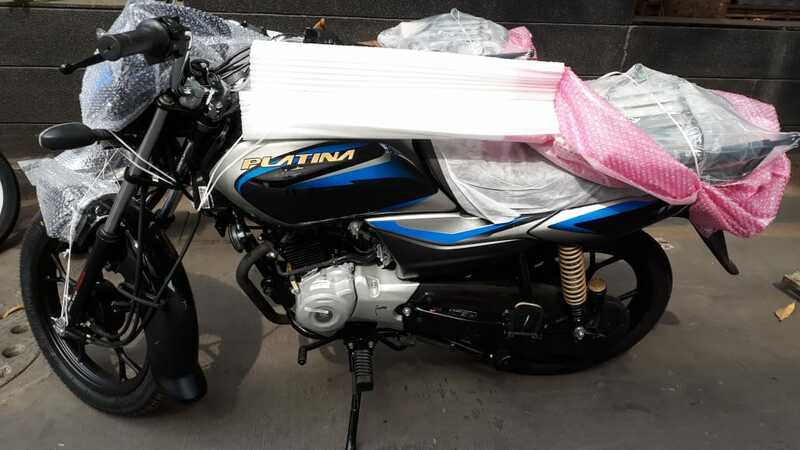 The Platina is one of Bajaj’s best-selling two-wheelers and competes with models like the Hero Splendor, the TVS Sport and the Honda CD 110 Dream.